Caught up again! Episode 11 is the conclusion of Kizaki’s (first?) arc, and episodes 12 and 13 are more about Shunpei, and his sense of worth as Haruto’s self-styled apprentice… but I’m actually just going to focus on how they encapsulate the theme of Kamen Rider Wizard perfectly. The conclusion to Kizaki’s 2 episode arc about his distrust of Haruto was, of course, exactly what we expected: he realizes that as a normal human who can’t use magic he can’t really fight the Phantom (he does show himself to be quite brave in the process, you have to give him that, whether you like him or not), and accepts that Haruto can. He leaves the protection of his dead partner’s son in Haruto’s hands, but, like Rinko before him, wants to go along and do what he can. I thought the moment when he asks Haruto to take him along was really nice. I think it’s one thing to accept that Haruto is the only one that can fight the Phantom, but it’s quite another to have the humility to acknowledge the fact that way. Now I’m wondering if that is the extent of Kizaki’s story arc. He can’t really go back to being an antagonist, and he would certainly always play second fiddle to Rinko as far as being Haruto’s support in a law enforcement capacity; so is this basically all there is to say, or is there more in store for him? I certainly hope for the later, because these episodes showed him to be quite an interesting character. As for the arc involving Shunpei’s upperclassman Tetsuya and the traditional sweets store where he’s an apprentice (episodes 12-13), mostly what I’ve got to say is that I like that this is the sort of show that doesn’t just fix everything at the end and have everyone return to business as usual. This could have all ended with the restaurant agreeing to do business with the store again, allowing Tetsuya’s boss to stay in business. Instead, the store, which was already just scraping by, definitely went out of business and Tetsuya’s boss had to sell, but he accepted it because his legacy would be carried forward by Tetsuya. Go back through these first dozen or so episodes and you’ll see this theme again and again, not just in the story of the week(s), but in the main characters themselves. All of these people have had something taken away from them, maybe they’ve had to give up on a dream, like Shunpei, or they’ve had to stop holding on the past. 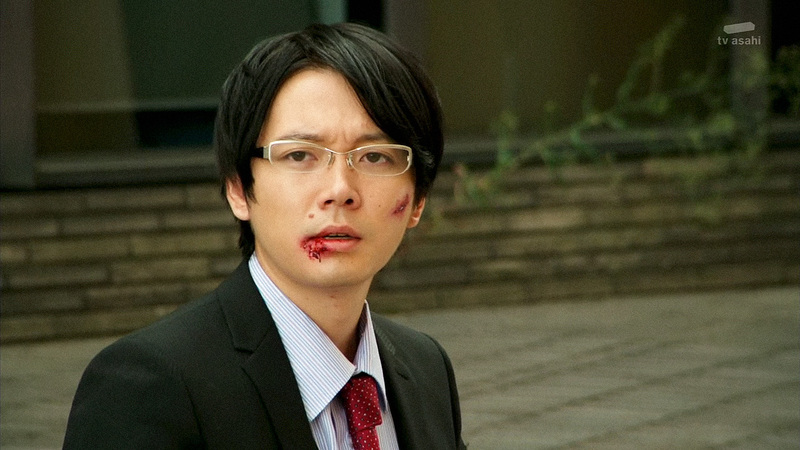 Kizaki lost his partner, and his also had to swallow his ego. In Koyomi’s case, she had to give up her very sense of self; and Haruto lost his parents when he was just a little boy. Loss is real and inevitable, it’s a part of life. We can either give in to despair when faced with it, or we can hold on to hope, accept our losses, and go on living with new purpose. This is the driving force behind Kamen Rider Wizard, and I really respect the show for being so frank about it. Now that his arc is done, I fear Kizaki would rarely appear, if ever. I would also love to see more of him. At the very least, him showing up later would hopefully reveal more about Section Zero’s progress with their phantom fighting strategy. I like that this is the sort of show that doesn’t just fix everything at the end and have everyone return to business as usual. I actually haven’t given that much thought before, but you are right that, in addition to the story arc guests, the main characters also lose something. They cannot change the past, so they have to accept that and, with the hope they have, learn to move on the best they can. And while that (accepting losses and going forward with hope as a moving force) is most likely the show’s main theme, I think it is mostly subtle (at least to me), and realistic, in the sense that no one is really preaching about it in show, and I like it much better than some show flat out telling me what they want me to believe. Wow, it looks like I’m picking your comments apart when I actually mostly agree with you. Hope you don’t mind all that much. About the whole realistic resolutions vs magical, everything turns out great resolutions, you’re right, Wizard has taken the realistic approach from the start, that was precisely my point in saying that acceptance of loss is the driving force behind Wizard. The reason I pointed it out is because I don’t take it for granted that any story will take a realistic, mature approach that doesn’t shy away from harsher realities. In this case, I think it’s a safe guess that Wizard‘s themes of loss and acceptance and finding new reasons to move forward are as much a response to last year’s events in Japan as Fourze was, and given how used I am to seeing children coddled and shielded from harsher realities of life, I do find it worthy of praise that the writers behind Kamen Rider Wizard choose to tell kids “sometimes you will lose things or people that are important to you, and there is no way to really fix that, but you can find the strength to move forward”. Basically, this is not an approach I take for granted, even in a franchise that has always had a certain bleakness at its core. And you are right, it wouldn’t be very effective if the show was being so obvious as to hang a lampshade on what it’s doing. If Kamen Rider Wizard is made in response to last year’s events in Japan, then I think what it is doing is worthy of praise. I tend to not guess at the intention of people behind fictional shows, but I probably should have noticed in this case, since I’ve already heard about Fourze‘s staff wanting to put smiles back on children’s faces (no wonder the show has an upbeat hero as its main character). In any case, I hope Wizard‘s message reaches the people who need it. Well, I don’t know if that is the reason, but it seems like a very appropriate theme for the moment, so… that’s just my conclusion.